Fascinating facts about Arthropods: * All possess exoskeletons, segmented bodies and jointed legs. ​* This group of invertebrates represents the world's most numerous creatures. * Arthropods have conquered the land, the sea and the air. Termite, Leaf Hopper or Fly in pillbox. Embedded within amber & placed in pillbox. Our choice of specimen. Embedded within shale. Our choice of insect. On shale. Well preserved specimen. Embedded in shale. From Green River formation. On ~ 2' x 2' slab of shale. Green River Formation. 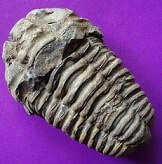 Rolled specimen; small in size. Presence of cheeks identifies this specimen as the original creature. 1 or 2 cheeks present indicating it to be the original creature.